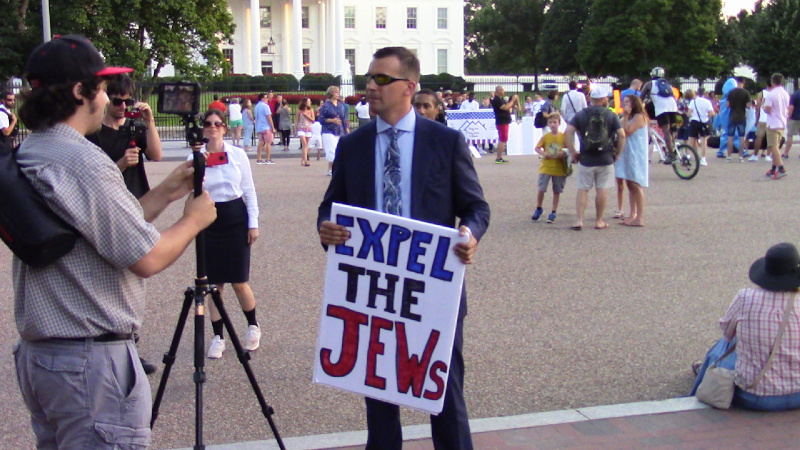 On the 9th of August, neo-Nazi Patrick Little showed up in front of the White House with an "expel the Jews" sign and two of his own media people. The media people were not obvious until he was followed away from all other media as many videographers focussed on him. Also on July 9, known members of the Proud Boys were spotted in Charlottesville. Update Aug 10: Reports on Twitter that Patrick LIttle was spotted earlier in the day at the Israeli Embassy. Update Aug 11: Washington Post reports Patrick LIttle called for torture murder of Jews in gab (Alt-right Twitter replacement) post. Gab's physical host Microsoft to order the offending post deleted. Patrick Little seemed entirely focussed on expelling Jews from the US, making up "historical facts" seemingly out of thin air to justify his positions. Patrick Little was videoed by News2Share saying we would gladly destroy a Holocaust memorial "made of sugar cubes." On another note, he denied that he would be attending Unite the Right II on Sunday. Dealing with him at the White House required extreme caution due to the known fascist tactic of deliberately starting confrontations with the intent of causing the arrests of their opponents. The fascist way of fighting is often "throw one punch and then hide behind the cops." Patrick's two media folks followed him out of the White House area, pursued by one anti-fascist journalist who managed to track them without being observed. Out of the White House area the two fascist journalists he brought became immediately obvious, focussing all their camera attention on the pursuing anti-Fascist and none on Patrick Little while one quietly exchanged words with him. Still, these fascist fools were not watching their backs, a mistake opponents of fascism must not also make. With fascists spotted in both DC and Cville three days prior to Sunday's fascist shitstorm known as Unite the Right 2, it looks like we may be in for a long, hot weekend.